Joan Miró’s Paysage (Landscape) is my favourite artwork in the National Gallery of Australia. This painting has always linked to my childhood experience of watching Italian animation series La Linea (The Line) on television. The show seemed to appear randomly, I never thought to seek it out through the television guide. I don’t think the La Linea and Miró’s works are artistically similar, rather it is the concept of creation from a simple line that has my mind automatically link the two. In the animation I had the illusion of an instant imaginative creation, and when I first saw Paysage in the NGA with its long lines it made my imagination work. I think for me the connection between the two is this creation from simple lines, La Linea is a demonstration and Paysage goes further by making the imagination work. Visiting the Joan Miró Foundation was a big deal to me in July of 2013. I had no concept of the artist past the art. During that first visit I spent most of my time in the temporary exhibition Joan Miró. Printmaking. 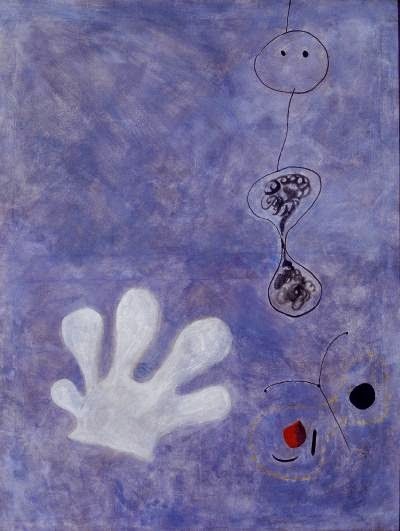 That time spent provided a depth of insight into Miró’s creative process. The exhibition followed his engagement with printmaking, particularly during the years spent in France as the Spanish Civil War was fought and lost. His artwork during this period dealt with his outlook on the conflict. From what I remember and the notes I took, much of the work exhibited constituted sketches or black line paintings and lithographs. Some of the work that appealed most to me were these black line works. This year, after managing to finally visit the second floor and walk through the entire Foundation, I feel like some of the most interesting and exciting works that push my imagination into high gear were in that temporary exhibition. 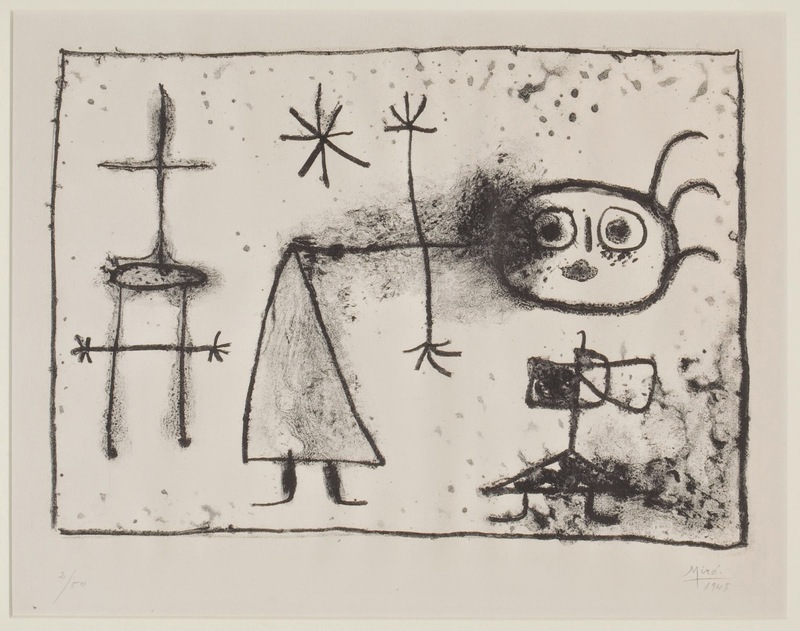 A poem, The Sun Eater, Catalonia, 17 July 1936 to 17 July 2013, Miró and Picasso, which is forthcoming in The Grapple Annual is my response to that first visit and my visit to the Picasso Museum during the same week in Barcelona in July 2013. The poem was started while walking through the temporary exhibition last year and finally finished just after this second visit to the Foundation. 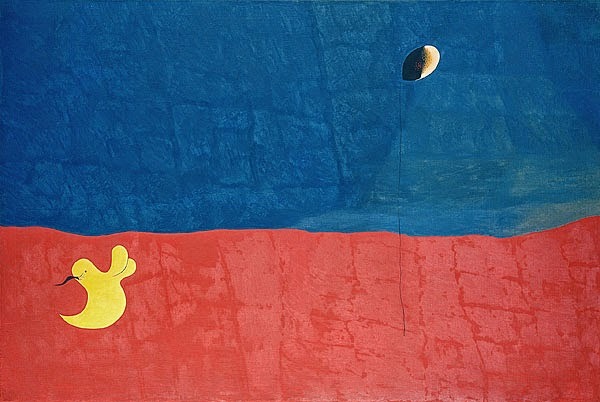 In the Foundation Miró is quoted as stating that his artwork is a starting point for the imagination. I am in Paris now, I took the TGV fast train from Barcelona to Paris. I fell asleep watching sunny dry Catalan countryside zoom past to the sounds of the Transistor soundtrack. I woke up to the sounds of Lume as I passed small French towns as well as farms that alternated white cows with fields of orange sunflowers.